Three years ago, there was a couple who arrived here in the Lion City with pretty much their entire lives packed in three huge suitcases. It was right in the middle of all the Chinese New Year festivities and as they thought they knew everything there is to know about this particular holiday, they were proven wrong within the span of a week. Walking around the hawker centres, they were startled by the sudden shouts and scenes of people standing around the table tossing shredded vegetables up in the air. It was madness! "What on earth are they doing? ", they'd ask one another. While this sight was very new to them, this couple was quick to adjust and have imbibed all the new customs and traditions that they have learned in their new home called Singapore. Above is a real, true to life story of Paul and yours truly. This was our first experience of the Singaporean-style Chinese New Year and having close to a dozen yu sheng salads, tossing veggies up in the air countless times and shouting all the possible wishes and blessings for the past 3 years, I'd say that Chinese New Year has quickly became one of my favorite holidays too. It's just as exciting as Christmas and New Year in Manila where the streets are well-lit and decorated with the cutest characters, there are pasar malams all over town where we would feast on the yummiest street snacks and of course, even shops would have their own promotions for people to shop, shop and shop! So, when I received an invite for my first ever lo hei at Cherry Garden, I made sure not to miss this opportunity. After all, the more lo hei, the luckier I hope I can be! 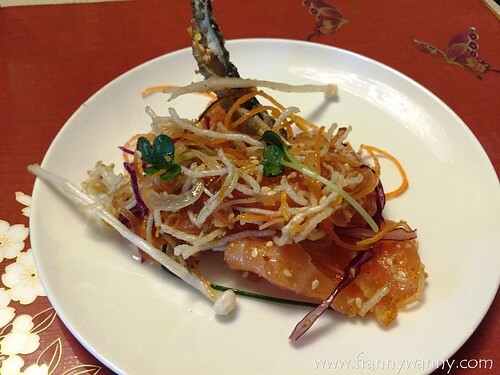 :P If you really thing about it, Yu Sheng (Raw Fish) Salad is a simple vegetable creation consisting of at least 8 different vegetables and ingredients. The most basic one would have carrots, cucumber, pickled ginger, pomelo, white radish, colored yam (green and red normally) and of course, your choice of fresh fish, the most popular one being salmon. In addition to this, you also have to add in some lime juice, toasted sesame, cinnamon, pepper and plum sauce. 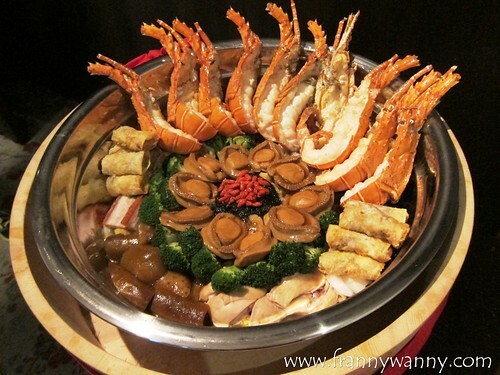 Other restaurants would offer really luxurious ingredients such as abalone, crab meat or even lobster too. 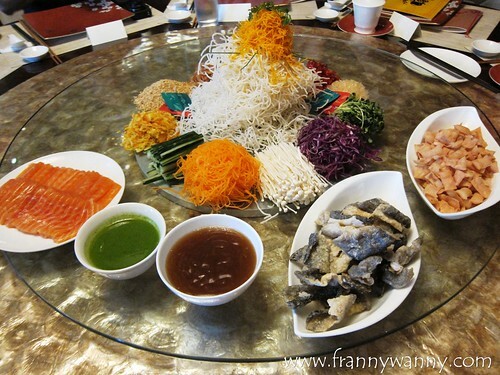 As for Cherry Garden, the special addition was the fried salmon skin which replaced the traditional Pok Chu crackers. This symbolizes prosperity and it's really yummy too! The beauty of doing Lo Hei lies in the whole step-by-step of adding a certain ingredient and saying some well wishes together with it. For families who are unsure which ingredients must go in first and next, majority of the restaurants would have servers who are trained to know all these and they would gladly do the whole thing for you too. Now, after all the ingredients have been added in. 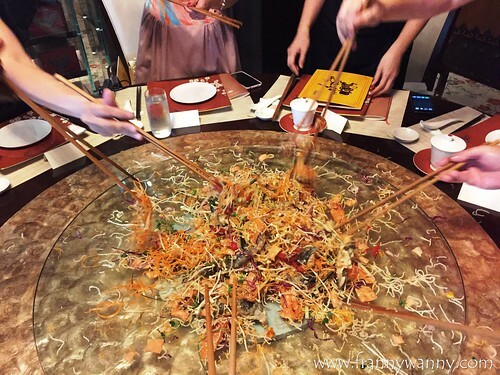 We all would gather around with our long chopsticks and that commences the tossing of all the veggies and fish up in the air. They say, the higher your yu sheng goes, the luckier you'll be. Shout out all your New Year wishes while doing so. This normally goes on for about 5 minutes or until a substantial amount of the salad has been scattered around the table. Following this, everyone just starts getting their own share of salad with people outsmarting one another to get the fish or the most amount of pok chu crackers. I love Yu Sheng Salad! In fact I do agree with my sister in hoping that this can be eaten all year. 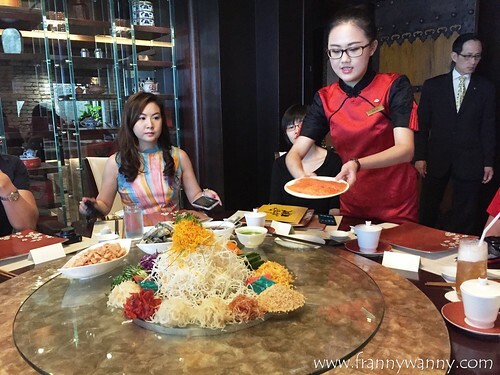 Cherry Garden's Prosperity Yu Sheng is also something worth raving about. We all loved the perfect balance of all flavors from the sweetness of the plum sauce, the sour kick from the lime juice and the freshness of the veggies. Not the mention the varying textures that you'd get in every mouthful too. After enjoying our Yu Sheng, out came the very majestic Luxurious Pen Cai. 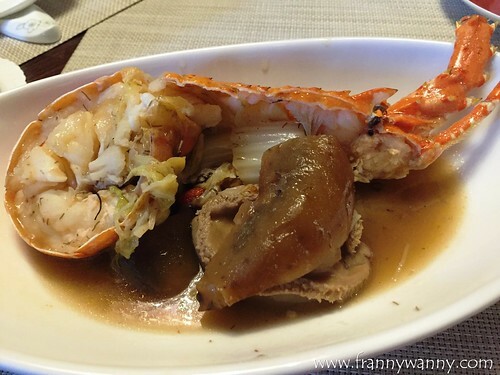 Another dish that is not commonly available in Manila. This is one big pot filled with the yummiest and most expensive seafood in the market. Our pot had Chinese mushrooms, black moss (my favorite! ), 4-head abalone, roasted duck, chicken, roasted pork belly, Chinese sausage, sea cucumber, dried oyster roll, prawns, dace filler and conpoy to name a few. They've also added in some veggies for a balanced meal. The pot was so big that we had two bowls with just individual portions of the ingredients found inside the Luxurious Pen Cai. I started with lobster, sea cucumber and abalone. So yummy! This was followed by meats such as the roast pork belly, chicken and Chinese sausage too. At this point, white rice would be the perfect accompaniment to such a filling dish. One thing that I love about pen cai is the fact that the broth gets more flavorful over the number of times it gets reheated. So imagine serving this in your reunion dinner and reheating this again for lunch the next day while tossing in more ingredients, you'll surely be in for a treat! Having both the Yu Sheng Salad and the Pen Cai makes for a very filling meal already. However, with the Success Set Menu at Cherry Garden, the feasting doesn't stop there. 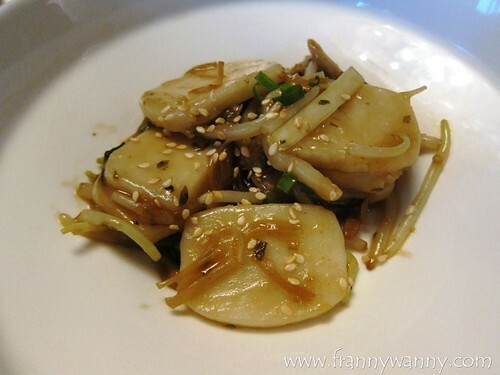 We moved on to the Braised Shanghai Nian Gao with Preserved Vegetables. This was served dry but should you have more soup stock from the Pen Cai, I recommend that you scoop some of the sauce in. 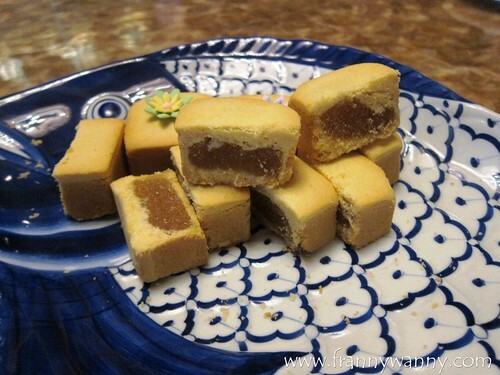 I prefer it done this way rather than to have it dry as the nian gao has a sticky and thick texture so having it with sauce somehow balances it out. I like how it comes with scallops, bean sprouts and some veggies too. At this point, I was ready to raise the white flag. I can't believe that we only had 3 dishes but a very filling one at that. Well, that's what Chinese New Year is all about. It's the time of the year to celebrate abundance, wealth and prosperity so you got to feast like there's no tomorrow! All three dishes were very rich and flavorful that the perfect way to end this is to have something very refreshing. 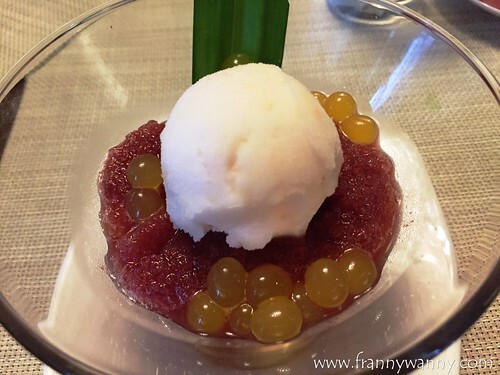 I was so happy to have this glass of ice cold Cherries in Nui Er Hong and Aged Kuei Hua wine cocktail jelly with Lychee Sorbet. Yum yum! The lychee sorbet was so delicious and it paired so perfectly well with the cherries. This was so good. If you love Pineapple cake then I think this is one of the best I've tasted. I love the buttery crust which is filled with sweet pineapple jam. The crust has a nice consistency that stays well together even after biting into it. I just do not like those that crumbles so easily. The Chinese version of the well-loved Ferrero Rocher, I'd say. 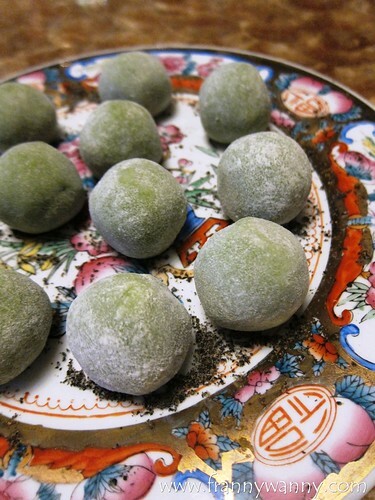 I love popping these into my mouth and carefully biting into the glutinous mochi until I get to the core where the macadamia nut can be found. This would make a great gift this Chinese New Year or something you can serve to visiting guests too. Cherry Garden is located in Mandarin Oriental Singapore, 5 Raffles Avenue, Marina Square, Singapore 039797. For reservations or inquiries, call +65-6338-0066.